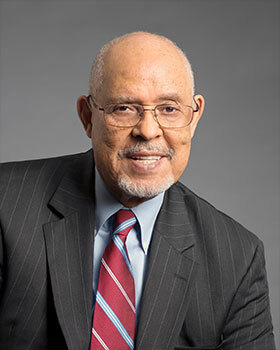 Ambassador James A. Joseph is emeritus professor of the Practice of Public Policy at Duke University. A Louisiana native, he has served in senior executive or advisory positions for four U.S. presidents, including Under Secretary of the Interior and U.S. Ambassador to South Africa. He also served as chair of the board of directors of the Louisiana Disaster Recovery Foundation and president and CEO of the Council on Foundations. While at Duke, he founded the Center for Leadership and Public Values as a partnership between Duke and the University of Cape Town.